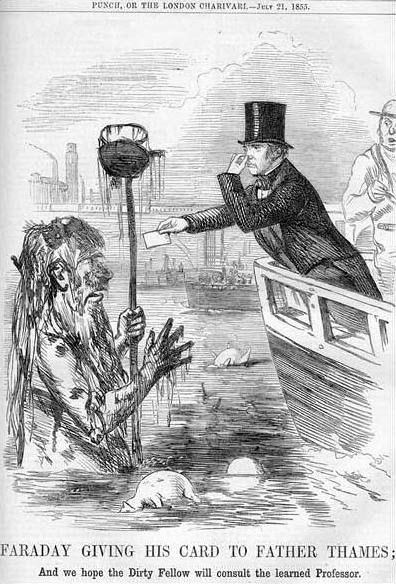 Effective action for solving Victorian London’s sewage crisis was put off for decades, due to chaotic governance, concerns about financing, the interference of vested interests and the complacency and inertia of central government. Once the ill effects appeared underneath the politicians’ noses, a lasting solution was quickly deployed. The modern challenge of finding the political will to deal with climate change is analogous, although there are additional factors that make fixing the climate problem much more difficult. Richard Alley, in his recent book Earth, the Operator’s Manual, devotes part of Chapter 16, Toilets and the Smart Grid, to a comparison between the infrastructure challenges caused by the sewage problems of Victorian Edinburgh and London and the obstacles we face today in acting to solve the climate crisis. In this essay, I cover some of the same ground as Alley, but use as a main reference the book, The Great Stink of London, Sir Joseph Bazalgette and the Cleansing of the Victorian Capital (GSOL), written by Stephen Halliday in 1999.Here’s a link to a pdf of pages 58-76 of the book. …going down into my cellar to look I stepped into a great heap of turds by which I found that Mr. Turner’s house of office is full and comes into my cellar, which do trouble me, but I shall have it helped. Cesspools were, over the years, dug deeper, sometimes down to a permeable sand and gravel layer, which allowed the liquid fraction of the waste to drain away, leaving less volume for the night-soil haulers to take away but polluting the aquifers from which some Londoners drew their water; eventually contributing to deadly epidemics of cholera and typhoid. A system of sewers was constructed in the sixteenth century, initiated by Henry VIII’s Bill of Sewers. This drainage system was designed to handle rain water only and there were statutes in place until 1815 that forbade disposing of household waste into it. In 1800, the population of London was nearly one million and, fifty years later, this figure had more than doubled. The system of cesspools and night-soil haulers, already strained, became overloaded. The growing physical extent of the city made the hauling of the waste more expensive; the supply of ordure was greater than the farmers needed; and the cost of emptying their household cesspools was more than many Londoners could afford. The introduction of South American guano in the 1840’s provided a cheaper and more easily manageable fertilizer that made the economics of human waste removal even worse. A technological solution was urgently required. A working flush toilet had been invented many years previously by Sir John Harrington, in 1596. The device was improved over time by several plumbers and engineers; including the felicitously named Thomas Crapper, who began selling his fixture in 1861, with the slogan “a certain flush with every pull” (GSOL, p. 42). Starting in 1810 and accelerating over following decades, flush toilets were installed throughout London. In 1815, the restrictions on disposing of household waste into the storm sewers were lifted. According to Halliday, this repeal was encouraged by lobbying from private water companies, which recognized that sanitation provided a business opportunity for them to increase their sales (GSOL, p.46). Between 1850 and 1856, the consumption of water in London doubled. It became increasingly obvious to Londoners that the city’s waste disposal systems were not sustainable in the face of a rapidly growing population. In 1839, an attempt was made to unify the governance of London’s sewage systems under a single authority. The plan was thwarted by opposition from the City of London, the small area of central London that is the financial hub of Britain and that guards its autonomy closely, even to this day (seeMonbiot, 2011). Until 1848, London’s sewers were managed by seven separate commissions with 1,065 commissioners. The Metropolitan Sewers Act of 1848 created a single body with a mere twenty-three appointed commissioners. The resulting Commissions sat for six sessions from 1848 to 1855 and achieved little. They were underfunded, lacked authority and were rife with competing interests. They evaluated 137 different proposals for improving the sewage system and implemented none of them. The flow of untreated sewage into the River Thames continued to increase. An effective management body, the Metropolitan Board of Works, was finally established in 1853. It made several recommendations to improve the sewage system but, over the next five years, was granted little political or financial support. Three years later, Faraday’s hot season came along and the stench from the river became so bad that the MPs in the newly constructed Parliament building could scarcely tolerate it. 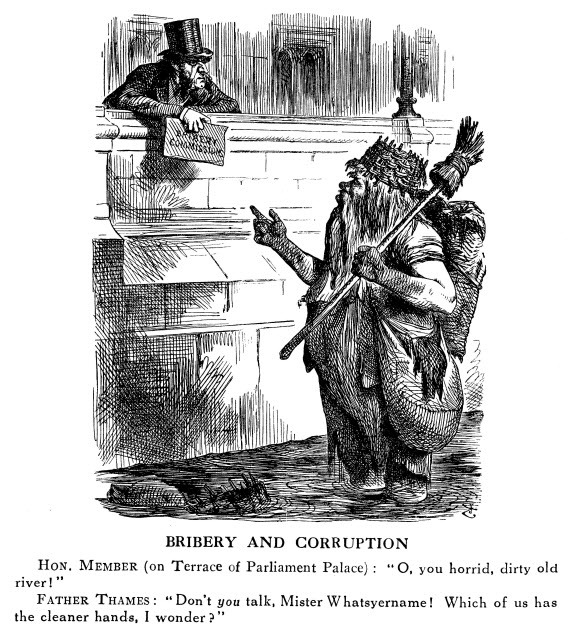 The Great Stink had the salutary consequence of focussing the minds of Parliamentarians and, on August 2nd, 1858, only eighteen days after the (Conservative) Chancellor of the Exchequer, Benjamin Disraeli, had introduced it, a law was passed that gave the Metropolitan Board of Works the authority to borrow £3,000,000 to construct intercepting sewers to prevent human waste being dumped untreated into the Thames. Under the direction of the engineer Sir Joseph Bazalgette, great embankments were built along the Thames. These embankments not only provided for the big intercepting sewers, which are still in use today, but also for parks, roads and sections of the London Underground District and Circle Lines. What can we learn about the climate crisis from this story? Traditional methods of dumping human waste products—whether from urban toilets or from fossil-fuel carbon dioxide—into common resources, like rivers or the atmosphere, become unsustainable as populations grow and prosper. However, in both cases, growing recognition of the need to change behaviour is resisted by vested interests and by inertia and complacency among legislators and their constituents. Relative costs are comparable: Richard Alley in his book Earth: The Operators Manual estimates that the costs of providing sewerage and clean water today amount to about 1% of GDP, similar to the mean of the range of costs derived from various estimates for stabilizing the climate. The GDP of Britain in 1850 was about £500 million and the cost of the sewage works undertaken by the Metropolitan Board of Works was eventually a little more than £4 million so, again, the cost was about 1% of British GDP; although much of it was borne directly by the ratepayers of London. a) Carbon dioxide is invisible and odourless; appreciating its effects on the climate requires some cerebral effort. In contrast, we all have daily familiarity and an instinctive, quite literally visceral, reaction to human waste. b) The climatic effects of excess CO2 in the atmosphere will not be distributed equally across the world It will adversely affect some countries more than others and the poor more than the rich. In contrast, the stench from the Thames afflicted everyone in central London equally, whether plutocrat or pauper. c) The contribution of individuals to the climate crisis varies enormously, with current emissions per person varying by an order of magnitude or more. Londoners contributed equally on a per capita basis (anatomically incorrect though that unit may be) to the city’s human waste problem. d) Victorian Londoners all belonged to one nation, with one language, one religion and one monarch and could be expected to show solidarity in a crisis. e) The climate crisis is gradual, with the effects unfolding over generations. The London sewage crisis became noticeably more noxious over the space of years. It’s relatively easy for us today to defer action on climate; most of us won’t live to see the worst consequences. f) Once the big intercepting sewers were in place, London’s problems eased. When action is finally taken on climate, the effects will not include a reversal of the adverse effects, but, at best, a stabilization of prevailing conditions. The mean effective lifetime of the fossil fuel CO2 in the atmosphere is 12-14 thousand years (Archer et al, 2009), the Thames in London is partially flushed twice a day by tides and continually by the flow of the river. g) The governance of London at municipal levels was initially chaotic and unequal to the task, but at least there was an over-arching and functioning government in the British Parliament, which was eventually able to create an effective management body, secure capital and raise taxes. In contrast, The United Nations Framework Convention on Climate Change has not yet, despite seventeen annual Conferences of the Parties, been able to produce an effective plan to resolve the climate crisis. In his recent book A Perfect Moral Storm, The Ethical Tragedy of Climate Change, Stephen Gardiner identified three “storms” that come together in a wicked synergy to make the climate crisis an especially intractable problem. The Global Storm. The unequal dispersion of cause and effect across the planet. See b), c) and d) above. The Intergenerational Storm. The effects of our emissions are deferred and will persist essentially for ever on historical timescales. See e) and f) above. The Theoretical Storm. We currently lack the institutions, conventions and tools—political, moral and economic—needed to tackle the exceptional problems posed by climate change and we are going to have to invent them as we go along. See g) above. So far, we’re not doing any better than cyanobacteria. No sane resident of a town or city in the developed world would nowadays challenge our sanitary laws and regulations on the grounds that they violate their inalienable right (in epidemiologist John Snow’s words, quoted earlier) “to poison to death not only themselves but their neighbours”. And nobody would claim that the scientific consensus on water-borne pathogens is an elaborate hoax designed to increase the authority and tax-raising power of municipalities. To be sure, there are valid objections as to how sanitary standards are to be set and enforced but no dispute about whether such regulations should exist. Since Victorian times, we have all of us changed our minds on this. It is tempting to despair that attitudes will never shift quickly enough to drive meaningful action on climate change. But public opinion has changed radically before; sometimes even in favour of minorities and against the vested interests of the powerful and privileged. An example that springs to mind from the time just before the Great Stink of London is the abolition of slavery. More recently, attitudes have changed radically on a range of social issues. When watching a period TV drama such as Mad Men, which strives for historical authenticity, it is surprising to see the extent that societal standards have evolved in just fifty years; previously commonplace attitudes and behaviours have now become unacceptable or illegal. Political change can be sudden and its relative painlessness can surprise the more pessimistic pundits. Consider the demise of the Soviet Union without the need for a global war, or of apartheid in South Africa, unaccompanied by the bloodbath and chaos that many saw as inevitable. No attitudes are immutable: the President of the United States is a black man. It was fortuitous that the centre of the Great Stink of London occurred just outside the windows of the British Parliament, spurring complacent lawmakers into overdue action, if only for the sake of their own comfort. But the chances are low that climate change will produce a perfect storm that could cause physical distress to our politicians in their chambers and, even should that happen, it would probably anyway be too late by then. If our leaders are ever to be motivated to timely action on climate change by a Big Stink, then that stink is going to have to be raised by us, their electors. This entry was posted in Soft Science and tagged Gardiner, Great Stink, History, Politics. Bookmark the permalink. New publication: Does it matter if the consensus on anthropogenic global warming is 97% or 99.99%? Just 50 years ago, no one knew why the Earth has mountains. Now we do. This is the story of how we figured it out - and how we keep learning.